Ripe with spectacular silhouettes, appearances, and locations, the Spring/Summer 2018 shows at Paris Fashion Week proved memorable. It’s no wonder why Paris has become a powerhouse in the fashion industry, showcasing some of the most discussed shows of the season with some of the most memorable moments throughout Fashion Month. 8:00 p.m. September 25, 2017. In the Musee Picasso, Jacquemus, a young french designer, was named in honor of his late mother. This start to fashion week provided an effortless feminine look with the use of softer textiles, allowing for more of a drape in combination with asymmetrical cuts as the perfect leeway into the coming shows. Saint Laurent mesmerized its audience against the backdrop of a sparkling Eiffel Tower. The collection consisted of the well-known Saint Laurent standard, while embracing it's Parisian background. One look that stood out was one of their bubble dresses, which seemed to float down the catwalk. This use of a structured textile and silhouette recalled the ‘80s-inspired look also seen at shows through Fashion Month. Rei Kawakubo for Comme Des Garcons lifted the mood of the week with a show that embodied a mixture of art and fashion. Inspired by the works of ten artists dating back to the 16th century, Kawakubo shaped looks such as a stiff and formed red plastic raincoat dress. This new approach involves creating looks that get the viewer to take a second look at what they saw coming down the runway. Paris didn’t come to play this season. It came to amaze. Labels like Givenchy aimed to bring back the ‘80s power shoulder with a modern twist. Rick Owens designed a collection based on current events around the world, giving off a rebellious vibe. Owens creates what he pleases and showcased pieces that were meant to bring discomfort in a romanticized way. 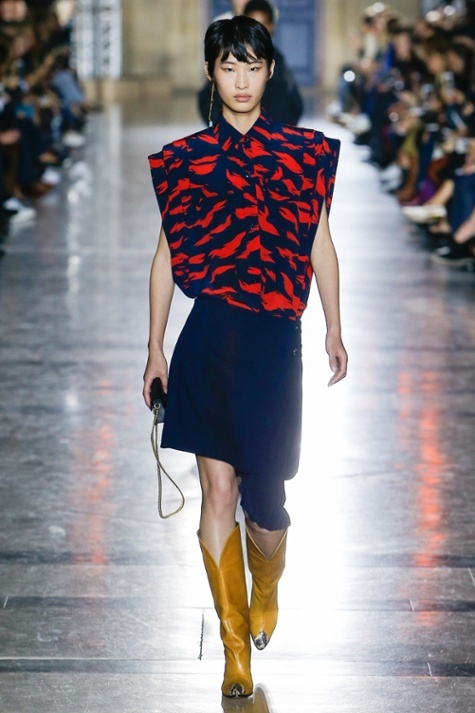 Owens accomplished this through his use of unnatural silhouettes in what seemed to be a frantic asymmetrical collection. Brands such as Chloe and Celine worked to refine the working women, creating a new silhouette and style for everyday professional wear. There were also interesting choices in shoes, which included platform crocs at Balenciaga, sneakers at Louis Vuitton, and thigh-high clear vinyl boots at Chanel. This season brought out a plethora of new styles and old ones with a modern flare, leaving the shows a success. Paris really outdid themselves there. Aside from the actual clothes, there were new and surprise appearances at the shows. Jane Fonda and Helen Mirren made their debut on the L’Oréal Paris catwalk, shocking all those in the audience. We also have been watching Kaia Gerber take the place of her infamous mother, Cindy Crawford, as her daughter opened for Chanel just 20 years after her. Is fashion finally getting the revival that it’s been needing? The trends spotted on the runway and the appearances made at Paris Fashion Week left all the other fashion weeks in the dust. It was truly spectacular and finally got more people to ruminate about what was seen. What are your thoughts on the shows from this season? What did you love and hate? What trends did you notice? Let us know below!